Helps very young children develop language and sensory skills, a prefect gift for Christmas. Series awarded "Best Buy" by readers of Prima magazine. Little man has a little basket full of books but none have yet grabbed his attention like this book, which I must say is because it is a touchy feely book. The pages are very clear and bright. P has just started to learn how to read and loves that she can read most of the words in the book to her brother. The book is great for getting you in the Christmas mood and would again make a great stocking filler. 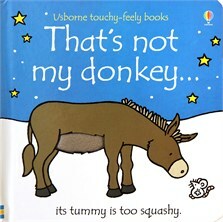 Through out the story you search for the author’s donkey on each page they point out different features on the donkey like their blanket, ears, hooves and how they are not quite right. As a parent of an 8 month old boy, I have yet to find anything like these books. Fantastic. My son has Down's syndrome - his development has been fantastic, which I truly believe these books have had a great help with.